Once again, I’ve been blessed with the chance to play a great game by G5 Entertainment. 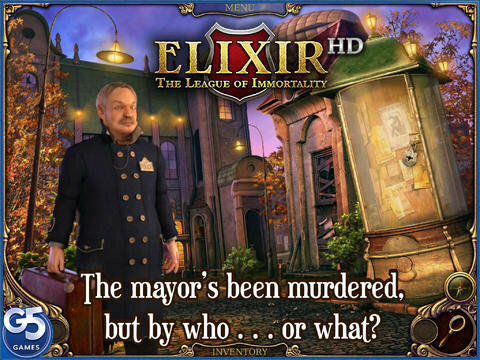 Elixir: The League of Immortality is another fine game in their line of point-and-click adventures mixed with hidden object scenes. Like the others I’ve played, this one lives up to the expectations. The story line revolves around the murder of a town’s mayor that you’re investigating. It’s no normal murder, though: the mayor was actually immortal. Not only that, you stumble across a horrific demon beast thing in his office when you first arrive. I won’t spoil any more, but the story progresses from here and makes you want to know more about where it’s going with each turn. The gameplay revolves around scenes. There are areas you can click on to zoom in, or pick up items from. You also can drag items from your inventory to an area to use them on things. As you move from scene to scene, you’ll find things you can’t inspect fully until you have keys or machine parts to access them. These are the first level of puzzle you will encounter. A second layer of puzzles that you’ll see will occur when you use a found item to try to access another. For example, at one early point, you’ll add some gears to a machine. Once you drop in the gears you’ve found, you need to solve a puzzle by dropping different size gears into an array to have them all turning. These are really fun and a great addition to the game. All in all, Elixir: The League of Immortality is a really fun casual title with a clever story that leaves you satisfied at the end. There’s not much room for replayability, but the game’s length is enough to feel like you’ve gotten your money’s worth. 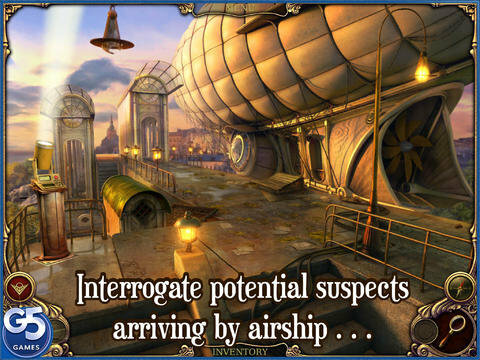 A Elixir: The League of Immortalityfree-to-try version with full game unlock IAP is also available.